If you want to have an idea on how to make money online and idea on ad placements, you can find a lot of inspiration from online newspaper portal. They are constantly evolving with market trends and very creative. Take for example 2 of the most popular newspaper portal sites in Malaysia: The Star Online & NST Online. Both sites have improved from the last time I wrote about them. The screen capture is taken today. 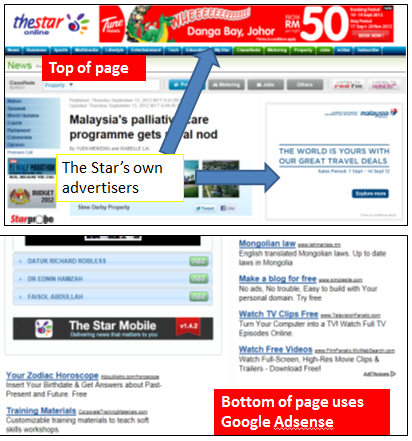 The Star Online now featured its own advertisers on both the header banner, and the box on the right side. The Google Adsense ads are still there, but given less prominence as before. It is now placed at the bottom of the page. Now, The Star Online gets a lot of online readers daily, considering it is the top English newspaper in Malaysia. We like to go online to share an article that we like with our friends. So as most readers are localised, local targeted ads would do well. 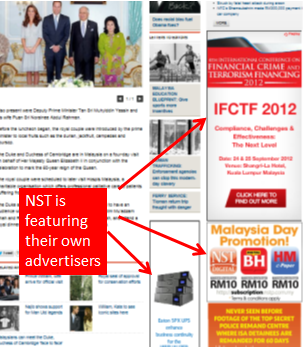 NST had taken down their Adsense altogether and instead, sell advertising space directly to advertisers. Previously the site used to feature Adsense. Google Adsense or Affiliate Advertisers? Google Adsense works very well if your visitors are coming from all over the world. The Google ads are able to display ads based on the geographical location of the visitors. However if your target visitors are localised, or those who spend the most time at your site comes within the same country, then displaying your own local ads may be more effective. You may go approach the advertisers directly, or go through locally ad placement agencies. But in order to earn, your blog must draw a high number of visitors. Some feel that using Adsense “cheapens” the site and may not want to advertise alongside with Adsense. Established blogs and sites that are doing so well and commanding hundreds of thousands and even millions of pageviews per month are doing very well selling their own advertising space, and even better, developing their own products. If their product are really of great value, they would make much more than Adsense can ever give them. For example, the developers who make WordPress themes like Thesis, Genesis, Woo themes- they earn so much that placing an Adsense ad would affect the product positioning. The trend is moving towards affiliate advertising and creating one’s brand, with selling online products. At least that’s what I noticed the top blogs at my favourite niches are doing. But for me, I am still sticking to Google Adsense. It pays on time, and being with Google is not complicated. I need not go and hunt and negiotiate deals with advertisers and worried about not being paid. Yes, Google gets a percentage of the cut, but if we think about it, without Google, we also have nothing. They send the traffic to our site… and then they pay us when the visitors click on the advertisements. And then they give us good tracking tools (Adsense, Analytics). I am grateful to them. Sure,I have to live with the ups and downs (in earnings). Sometimes my page rank dropped to nothing when they tweak their search engine. But overall, my traffic over the years have been climbing up even though it is slow and steady. I’ve learned that the most important thing is that you need to remain true to your aspirations and motivations that made you start the blog in the first place. Write from the heart, and be sincere in what you write. Have your own voice- don’t scrap other people’s contents. Personally, I believe when your hobby becomes your source of earning, everyday doing the same thing over and over again…. the love you have would eventually turn to aversion. Or burnt out. Many people are having blogs- setting a blog, writing an article is so easy to do now. And many people are talented. It’s very hard for you to ‘stand out’ from the crowd and the noise. You may earn 20,000 a month from your sites but it is so uncertain that it can be gone overnight. I’ve seen many of the top bloggers dropping in popularity and earnings- replaced by young, energetic competition. And to get to the part where you earn 20k requires grit, effort, sleepless nights, endless of tweaking sites, writing guest posts, etc. If you invest that same energy and passion in your day job, you can be somewhere with a fat bonus. Companies value those with passion, creativity, willingness to work hard and not giving up at the faces of adversity.